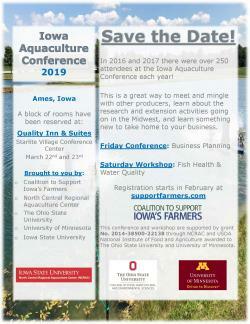 In 2016 and 2017 there were over 250 attendees at the Iowa Aquaculture Conference each year! This is a great way to meet and mingle with other producers, learn about the research and extension activities going on in the Midwest, and learn something new to take home to your business. Start and end time on the days of March 22, 2018 and March 23, 2018 subject to change.